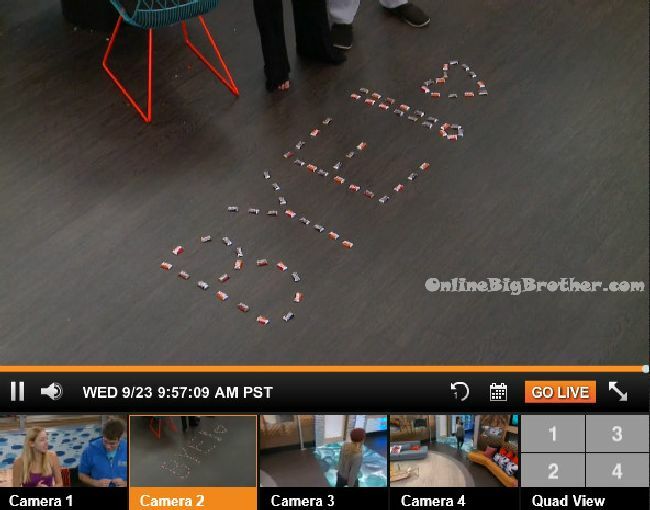 A HUGE Thank You To All The OnlineBigBrother Supporters! Simon and I would like to give a HUGE thank you to all of the amazing OnlineBigBrother.com supporters that have made donations and contributed by making purchases through our Amazon.com and Amazon.ca links, in addition to helping provide support through other means as well. Without your continued generosity and support, all of the 24/7 live feed updates we provide would never be possible. The donations go directly towards covering the costs associated with running this site. We are so thankful to have such an amazing community of readers, commenter’s and followers. 9:20am – 9:30am Big Brother wakes up the house guests. 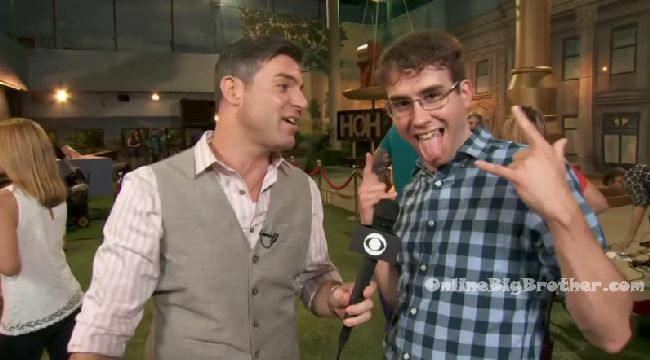 Steve says it creeped them out on the “spaceship” (sequester) about how much he knew about big brother. Vanessa and Steve say they couldn’t sleep last night. Vanessa says she had anxiety dreams. Steve says he’ll tell them his dream when the go upstairs. 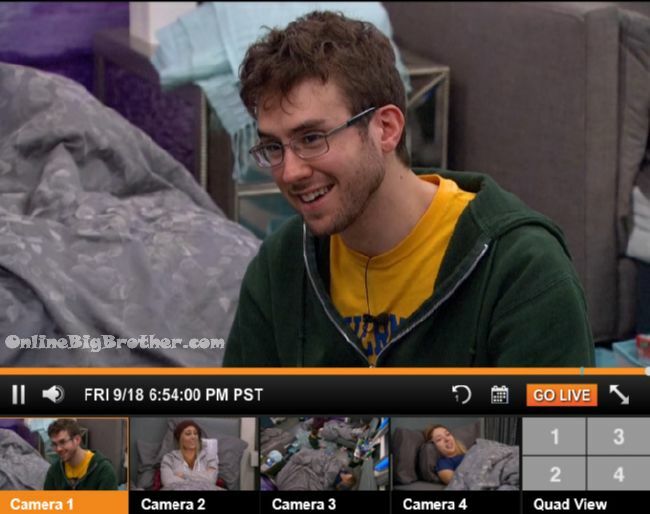 Steve jokes about Liz dreaming about camping over and over again. Liz says there will be camping after tonight. I am not even afraid of saying it. 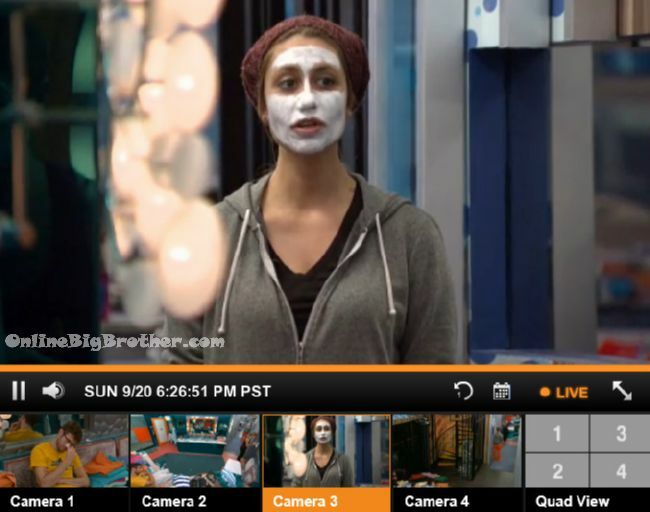 Vanessa jokes about Austin’s pony beard. Liz says I want that ponytail beard gone my nah nah is going to be like what the heck is that?! 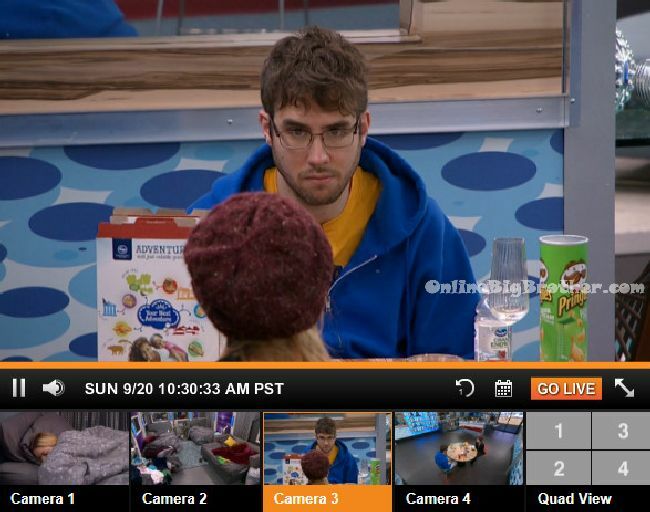 Liz heads to the kitchen to make breakfast Steve tells Vanessa that his mom is going to attack him like nobodies business. 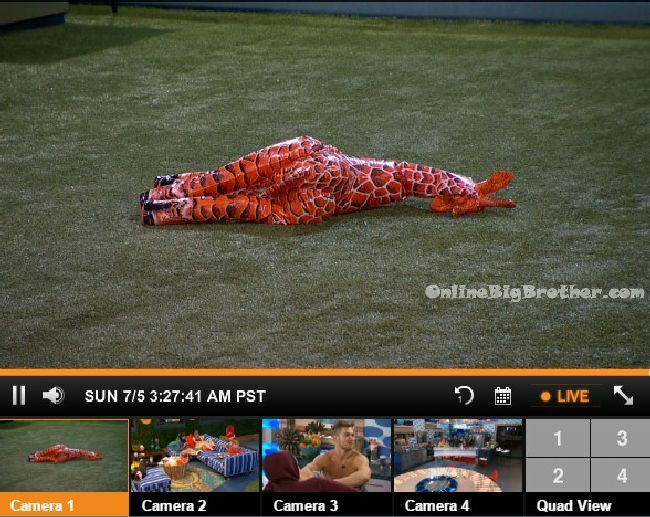 10:20am – 10:45am Big Brother wakes up the house guests. Vanessa and Steve get up. Steve comments that he hasn’t even thought about packing yet. You guys have done a lot and I haven’t even started. Vanessa says that’s because we’re good girls and you’re a bad boy. 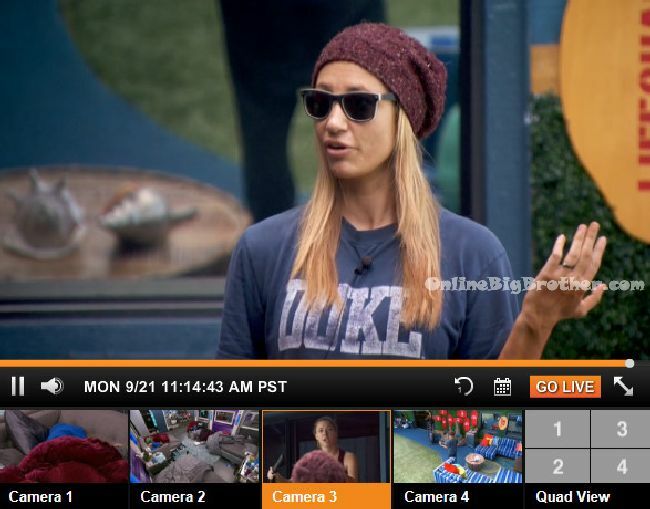 Vanessa says how cool would it be if it was over today. I would be so happy. Steve says I like it tomorrow better. Vanessa says No dude I’m ready to go! Steve says I wasn’t ready for last night to be the last night. Vanessa asks what do you do when you’re up late? Steve says Scamper? I walk around in an attempt to sleep and realize I can’t sleep. 11am Vanessa asks has Steve talked to you about anything gamewise? Liz says no. Vanessa asks you give me your word? Liz says no a million percent! Obviously he has talked with you because he has not talked to me about anything. Vanessa says no matter… I am just going to ask you one thing.. you’ve given your word you were never going to tell Steve about our deal right?! Liz says 100% I haven’t! Vanessa says and I am good for that deal. He just can’t know about it. No matter what he might come to you and say over the next couple of days.. you know the real deal is what we have. I give you my word on Mel. Okay! Liz says I know. 12:45am Steve says my goal coming into this game was just to survive the first eviction because I knew I did not have the social skills to get far in this game. I was hugely relieved when I won the veto the first week by spelling trombonist. I pulled my act together, I made some moves and here I am in the final 2. When you break the game down you can really put it into 3 components. Competition, Social Game and Strategic Game. First Competitions – I’ve been head of household 4 times and each of those four resulted in eviction. Liz has only been head of household 3 times and she was dethroned once so only 2 of those ever came to an eviction. 6:00pm Vanessa and Steve Speculating that tomorrow is their last day outside. Steve – Is that better for her. 10:20am – 10:40am Big Brother wakes up the house guests. Liz complains about having to put the outside awnings down. She says they’re too hot. Steve puts oven mitts on. Liz puts gloves. on. Steve says he has never heard of so much complaining in such a short amount of time. Liz says if we just stayed in side we wouldn’t have to do this. Steve says its big brother that tell us to do it. Liz says she’s never doing it again. Steve says we’re the only two people that can do it. When they’re done. Big Bother says thank you very much. Liz says that was a dig because I wasn’t very cooperative. Liz heads back to bed. 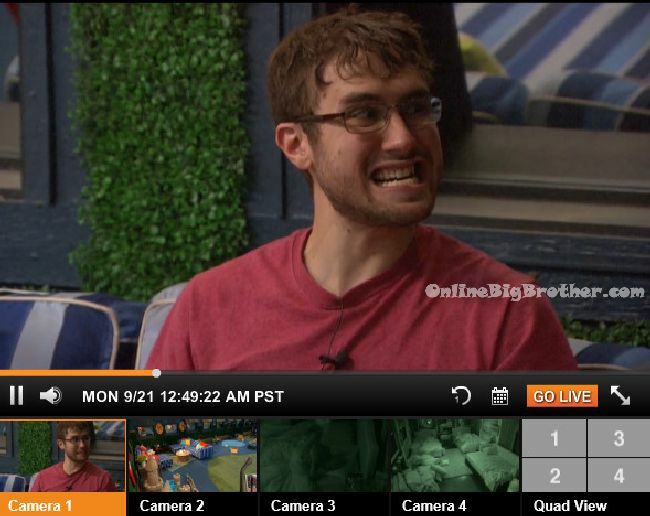 11:12pm Feeds come back Steve won..
Steve winders when they should tell Liz. Steve – I want to drink with Jace I really do, I love him so much. Steve – I have a man crush on Jace..